I admit it: I have always hated the Road Runner. Even as a child, my sympathies lay with Wile E. Coyote, paragon of perseverance and futility. I felt sorry for that hungry, hapless would-be carnivore. And I found nothing endearing in the arrogant invincibility of that braggart bird and his exasperating, “Beep, beep!” Not only was he impossibly fast, but somehow even gravity seemed to show him favor. It just wasn’t fair. At the very least, someone needed to file a lawsuit against the Acme company for their inevitably dysfunctional products. I apologize to all you youthful types who don’t know what I’m talking about. It’s a cartoon. An old cartoon. You can check it out here if you like. My frustrations with the Road Runner aside, one nice thing about cartoon characters is that they never die. Drop them off a cliff, and they crawl out dazed. Run over them with a steam roller, and they walk around flat for awhile. Blow them up with a roomful of TNT, and they get all black and smoky, but a few frames later they’re good as new. But what if a beloved cartoon character did pass on? And what if you were invited to give the eulogy at the funeral service? That was the writing assignment idea that sprung from my cartoon contemplations of that rascally Road Runner. To the dismay of children everywhere, your favorite cartoon character has died and you have been invited to say a few words at the funeral. Write the speech you would give in memory of the character (a speech given in someone’s honor at a funeral is called a eulogy). Be as clever and creative as you like. You may refer to the manner in which your cartoon friend has passed away, just don’t get graphic or gross — only include what would be appropriate at a funeral. * If you do not prefer cartoons, you may substitute a fictional character from a book you have read. Like this article? Please consider sharing it or subscribing to our weekly email update! Post any comments and questions below. Bloggers love comments. Sunday Comics: Stop Teaching Your Dogs Bad Grammar! 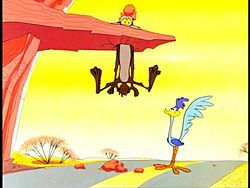 The Road Runner’s arrogance aside, I always found it entertaining to see Wile E. Coyote fall thousands a feet and then have the obligatory anvil or bomb land on him moments after he realized he had survived the fall. Agreed – Acme’s manufacturing standard’s left much to be desired. It’s probably the result of that cartoon series that the name doesn’t inspire confidence to this day. Awesome idea for an assignment. Love it.